Duncan McNicholl is the general manager of Whave Solutions Ltd., a Ugandan nonprofit social enterprise that provides water source maintenance services to communities. A civil engineer by training, Duncan worked for five years in Africa on the Malawi Water and Sanitation Team with Engineers Without Borders Canada. He holds a PhD from Cambridge University, where he studied how social networks support institutional development for rural water service delivery. Matt Guttentag is a program director with LINC. He specializes in systems analyses for complex international development projects working with partners across the private, public, and nonprofit sectors. 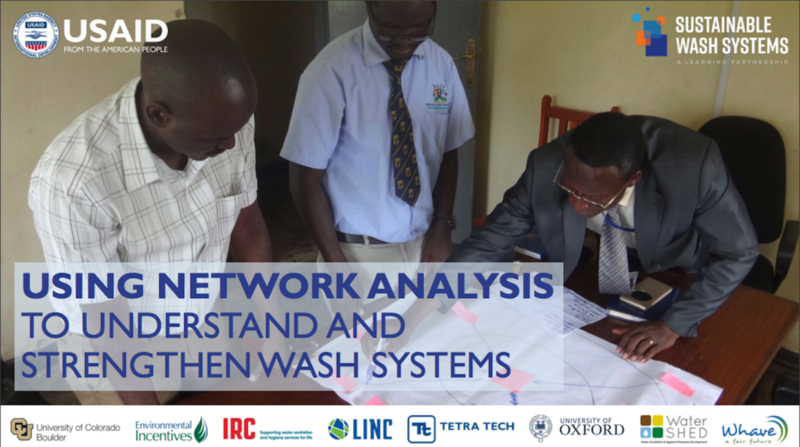 Most recently, he has focused on using social network analysis to help clients understand and improve global and local networks in the health and water sectors. He was previously a partnerships advisor with the U.S. Global Development Lab at USAID, and has served as a strategy consultant for leading corporations, foundations, and government agencies. Matt has an MA from the George Washington University and a BA from Duke University. Janita Bartell manages research and learning at WaterSHED, a Cambodia-based NGO using a systems approach to build sustainable WASH markets. Her work helps WaterSHED to understand the social drivers of WASH behaviors and how to build interventions that effectively address them. Through her work and studies in the U.S., Peru, Tanzania, and the U.K., Janita has developed a keen interest in the social dynamics that drive behavior and how they manifest into tangible outcomes such as wealth distribution or health. She holds a MSc in sociology from the University of Oxford. Lucia Henry works on water and sanitation projects at Tetra Tech. She has a background in market-based approaches and human-centered design in sanitation and health, and integration of hygiene and health interventions. Lucia has worked with community-based organizations, governments, and NGOs in Burkina Faso, Democratic Republic of Congo, Ethiopia, Jamaica, Liberia, Saint Lucia, Vietnam, and Zambia. She holds an MSc in water and environmental engineering from the University of Surrey and a BSc in biotechnology from Rhodes University. Elizabeth Jordan is a water and sanitation advisor in USAID’s Office of Water, where she supports missions on WASH-related strategic planning and project design. Elizabeth also leads efforts to improve USAID’s monitoring and evaluation for WASH programs, works to build capacity of USAID staff, and oversees various WASH research activities. She previously worked in western Kenya, managing the field implementation of a randomized control trial to study of the effects of WASH and nutrition interventions on child growth. Elizabeth has a PhD in civil engineering from the University of Colorado Boulder, as well as BS and MS degrees in engineering from the Massachusetts Institute of Technology. The content was very good and the discussion afterwards was also informative. Just the connectivity / sound was a challenge. Otherwise I would rate this a 5! Great webinar. Interesting topic. Connectivity issues for some speakers was an issue, but team worked through it. General Manager, Whave Solutions Ltd.
Duncan McNicholl is the general manager of Whave Solutions Ltd., a Ugandan nonprofit social enterprise that provides water source maintenance services to communities. Lucia Henry works on water and sanitation projects at Tetra Tech. She has a background in market-based approaches and human-centered design in sanitation and health, and integration of hygiene and health interventions.